IS THIS THE BEST NEW WAY TO GET PROTEIN INTO YOUR BREAKFAST? Looking for a way to get protein filled breakfast but still enjoy the staples that make breakfast so great… like say pancakes? Well we’ve found a new kind of pancake that is so filled with protein – it’s perfect to enjoy occasionally in any bodybuilding diet. It’s called Mancakes and it’s the ONLY High-Protein Pancake, Waffle and Baking mix of its kind. Mancakes is opening the door, allowing people to think about positive nutrition through innovative and delicious foods, foods perhaps not typically associated with health and fitness. Mancakes are formulated to deliver powerful, healthy ingredients without sacrificing the wonderful flavor, experience, and convenience of pancakes and waffles. Available in 6 different flavors, each bag of Mancakes mix makes about 30 four-inch pancakes or 1 large waffle with each serving containing 4-6 Superfood ingredients that provide 20-23g Protein and 4-10g Fiber with between 18g and 38 Net Carbs and 2-7g Sugar, all from soy-free, gluten-free, and non-GMO sources. Flavors include Buttermilk, Cinnamon Oat, Maple Bacon, Light Chocolate, Pumpkin Spice (seasonal) and our newest flavor Lemon with Chia! Super easy with just add water recipes and the ability to make convenient on-the-go protein snacks like muffins, cookies, donuts and breads! Finally, an indulgence that fuels your lifestyle!Available nationwide at Vitamin Shoppe, select GNC locations, various nutrition stores nationwide, and available on www.eatmancakes.com and Amazon.com. Our latest and greatest fiber packed syrups are delicious flavors of goodness! Available in both Blueberry and Maple flavors, our syrups have No Gluten, No Soy, No GMOs, No Artificial anything. Each serving provides 20% of your daily value of fiber, which can aid in weight-loss and help you feel fuller longer. helps you feel fuller longer. Combine with our Mancakes pancake mixes and you can get up to 60% of your daily value of fiber and over 40% of your daily protein in one delicious meal! Our syrup is also low in calories and sugar. One serving is only 30 calories and 5g real sugar (no sucralose!). You can also use it in baking and smoothies as a natural sweetner! Available nationwide at Vitamin Shoppe, various nutrition stores nationwide, and available on www.eatmancakes.com and Amazon.com. 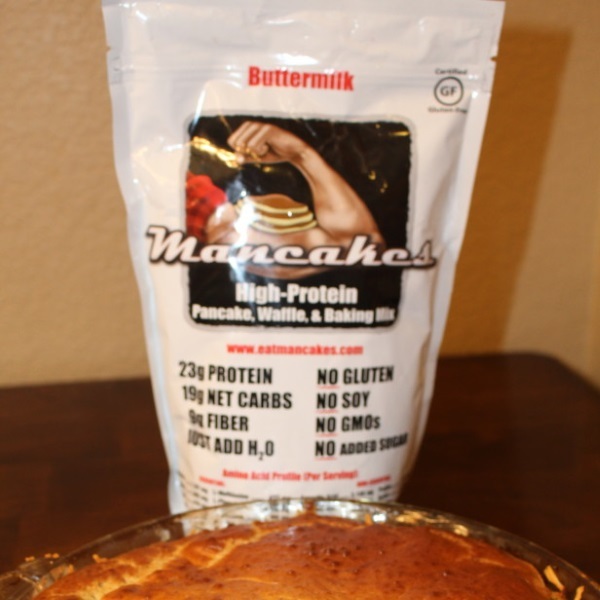 Mancakes is the only NO Gluten, NO Soy, NO GMOs, NO Artificial Anything brand of Protein pancake/waffle/baking mix, High-Fiber Syrups and NEW innovative food items! EAT REAL.